Is it Time to Clean your Diesel Filter? We offer automated and semi-automated stations. What is a filter cleaning station? The off-vehicle filter cleaning stations use a process of heat, air, and vacuum to clean passive, active, corierite, and silicon carbide filters. The Standard Cleaner requires an eight hour reneration time for all filter types, and allows for slow temeprature increase and continuous air supply to prevent damage. 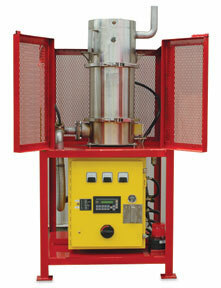 With a red containment cage to warn those nearby of heat, the Standard Cleaner is the most economical, safe, and environmentally friendly way of cleaning your filter without sending it away to be cleaned and regenerated.The Automated Cleaner eliminates operating handling, and has temperature sensing and programming abilities to prevent filter damage and damage to the catalytic coating of the filter. The Automated Cleaner is digitally programmed with touch pad and LED display of progress fault codes, and requires 3-hour regeneration time for silicon carbide and cordierite filters. Contact us for a price quote or more information.